No complains at being shown red. Ayr’s Craig Moore got sent off yesterday in spectacular fashion. 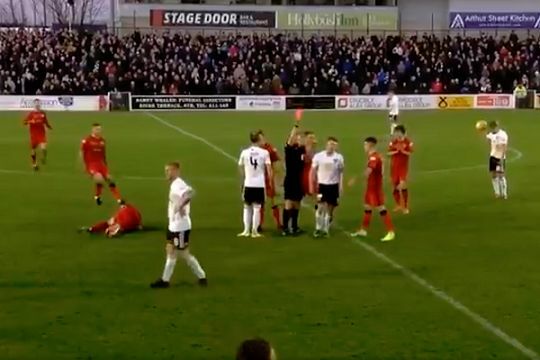 Ayr United forward Craig Moore was sent off for kicking Greenock Morton’s Gregor Buchanan in the nuts during a 0-0 draw at Somerset Park on Saturday. Moore ends up on the floor after jostling for possession with Buchanan, who ends up trying to kick the ball ‘through’ his opponent during the Scottish Championship clash. This elicits an angry reaction from Moore, who aims a backwards kick into Buchanan’s groin, sending him crashing to the turf. As he walks off the pitch having been shown red, he appears to have no complaints.